why is this little bathroom in the middle of now where - a toilet place in a jungle? Do you know if these can be purchased instead of rented? I have a pool, but really not much space for an outdoor bathroom.. this would be perfect instead of having people go through my house with wet suits and such to use the bathroom. I think its adorably quaint. As I was looking at it, on the side, I had the impression that the wood is just for show to give that retro feel. I would make a door and put in an impermeable material between the toilet and the handwashing station, install a sink with running water and soap and hand creams, ensuring that both the toilet and the handwashing station were very separate and impeccably clean. Add a few magazines and a very comfortable toilet seat with white pvc everywhere on the walls and, voila! Just another clean, welcoming private space but in the wild. Bathroom? - Does it fit one or two people? Sometimes our house gets a little backed up. The Airstream does not have a fully functioning commode, so the couple built an outhouse in the woods. 7. Where will everyone go to the bathroom?Chances are, if you’re remodeling one bathroom, you’ll have a powder room or another bathroom to use. But think about how long you’ll be sharing a bathroom with your family members. Also, your contractor and workers will need a place to go as well, and it’s not recommended that you open up a downstairs powder room to a cadre of construction workers. What to do: Get a portable bathroom for workers. Conrado says a portable toilet costs about $100 a month, and there are higher-end versions for homeowners if you’re doing a remodel that will knock all your bathrooms out of commission. Outhouse. 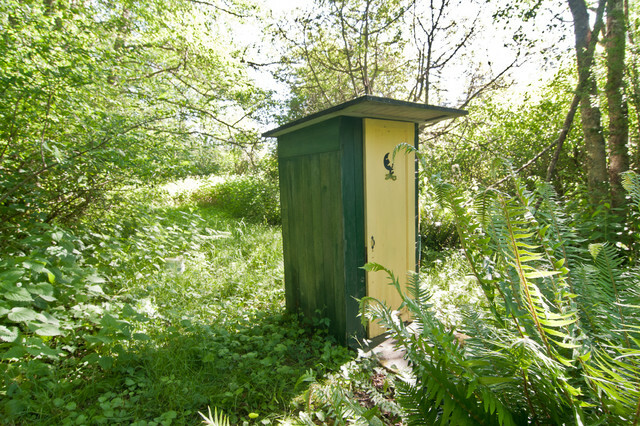 Before indoor plumbing and flush toilets, people used an outhouse. Some still occasionally turn to this bathroom. That was the case for a Washington couple who lived in an Airstream and used an outhouse in the woods while they constructed their Salsa House. Your turn: Share your bygone home feature stories and photos in the Comments section! Its a real outhouse. thats pretty cool. Our new bathroom, solved all the design issues!!! !